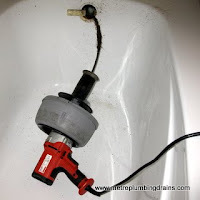 Clogged Bathtub and Shower Drain is a common result of hair, chemical and other "nasties" build ups. If you noticed a clog up, it is in your best interest to call a professional plumber to clean that drain up before it causes more damage to your property. Clog ups take time to develop and cannot be noticed until the drain is already blocked. Clog ups require immediate attention and should never be ignored as they will not disappear on its own. It is also highly recommended to figure out what exactly is causing your drain to clog up in order to prevent future reoccurrences. Unlike other plumbing companies that will fix the problem by just patching it up for the time being, Metro Plumbing & Drains resolves all plumbing situations by first getting to the root source of the problem, and only then fixing it. This approach ensures higher chances of permanently eliminating the problem, and reduces the chances of it reoccurring over the time. Number one reason for almost all clog ups is hair. Not only do it sticks to the walls of the drain pipes but also has a tendency to catch other passing by debris, creating clog ups. Another common reason of clog ups is soap scum. You would think that soap dissolves in water, but it actually builds up on the walls of the drain pipes gradually clogging it up. The use of hard water can also result a clog up for your bathtub and shower drains. Even though this process cannot be observed but hard water tends to leave behind solid material on the sides of the drain, narrowing down the natural flow of water and making it easier for any other debris passing through to catch on to your drain and cause clogs. A combination of all three sources will noticeably speed up the debris build up process. A combination of all three sources will noticeably speed up the debris build up process. Even though bathtub and shower clog ups can be prevented, but it's not always possible, and can get frustrating and time consuming. 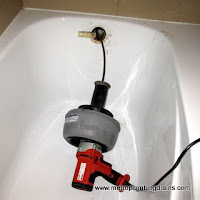 Consult our professional plumbers on what can be done to reduce the chances of continuous bathtubs and shower clog ups and receive a FREE ESTIMATE.